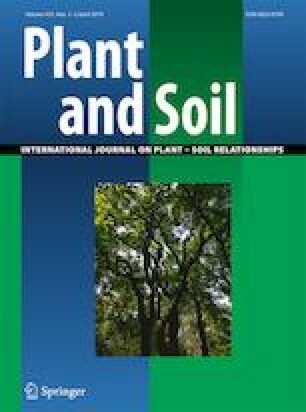 This study aimed to determine quantitatively the value of AMF in supporting plant growth at various levels of both P and Zn simultaneously. Linseed (Linum usitatissimum L.) was grown in a black vertisol at a range of applied P (0–400 mg/kg soil) and Zn (0–60 mg/kg soil) with and without arbuscular mycorrhizal fungi (AMF) in a glasshouse experiment. Without AMF, linseed did not respond to either P or Zn applied alone; very high rates of both P (400 mg/kg) and Zn (15 mg/kg) were required for good growth. Plants with AMF grew as well with just 50 mg P/kg and 3.75 mg Zn/kg. AMF markedly increased P content of the linseed whole tops at all levels of P and Zn fertiliser, and increased Zn content in the presence of P fertiliser rates up to 200 mg P/kg. A dual rescaled Mitscherlich equation, with terms for both P and Zn was derived and used to calculate plant growth responses and savings of P and Zn fertiliser by AMF. AMF are clearly effective in reducing requirements of both P and Zn for efficient production of mycorrhizal-dependent crops. Diagnosis of AMF levels will allow more efficient use of P and Zn fertilisers saving on costly inputs of declining resources. We thank the Australian Centre for International Agricultural Research (ACIAR) for funding to conduct this research, Tim Clewett and Martin Fiske for their technical support and Dr. Adam Sparks for the 3-D surface diagrams. We also wish to thank Dr N J Barrow for suggesting rescaling of the Mitscherlich equation to include sigmoidal responses.